Vaporeon in game: 659 Who? Important notice! Pokemon Vaporeon is a fictional character of humans. Vaporeon is a composite creature sharing physical traits of aquatic and land animals. It is a quadruped with three small toes on each foot and dark blue paw pads on the hind feet. 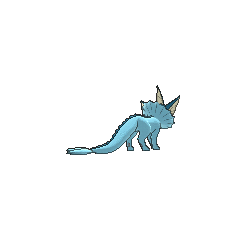 Vaporeon's body is light blue with dark blue marking around its head and a ridge down its back. This Pokémon has a split tailfin that has been mistaken for a mermaid's in the past. It has a white ruff around its neck, and three fins around its head made of cream-colored webbing. It is said that rain will come within a few hours if Vaporeon's fins begin to vibrate. 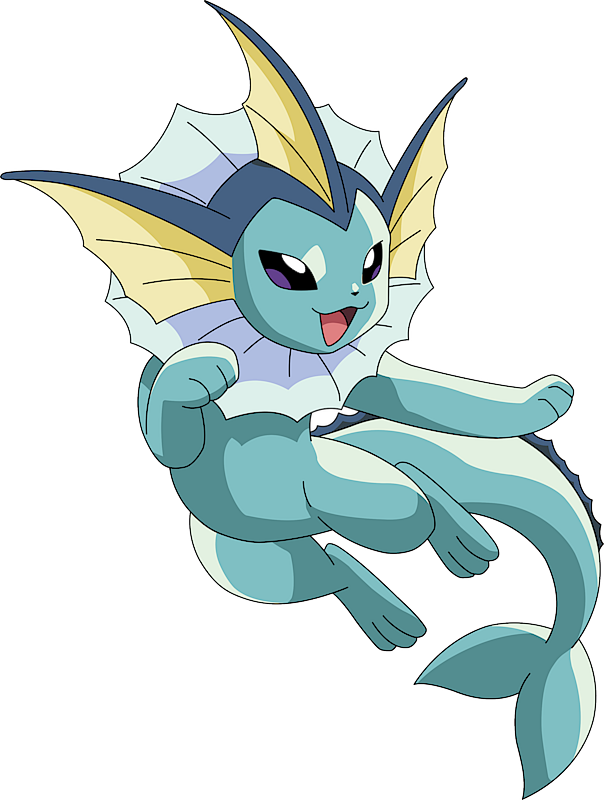 Vaporeon is mostly found in urban settings and is rarely seen in the wild, but it can also be found near clean, fresh lakes. It has evolved to become better suited to an aquatic lifestyle. In addition to developing gills, it has a cell composition similar to water molecules. This structure allows Vaporeon to melt into water at will and keeps it camouflaged as it swims. Ash battled against a Vaporeon in the Pokémon League entrance exam in The Ultimate Test. In Mewtwo Strikes Back, a Vaporeon owned by Fergus was one of the Pokémon that were captured and cloned by Mewtwo. The Vaporeon clone is seen again in Mewtwo Returns. Vaporeon was also seen under the ownership of one the Kimono Sisters in Trouble's Brewing and Espeon, Not Included. An old woman named Galea owned a Vaporeon in On Olden Pond. 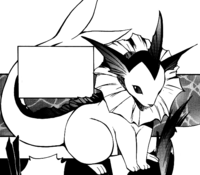 A Vaporeon belonging to Ursula appeared in Last Call — First Round! where it evolved from Eevee during the Performance Stage of the Sinnoh Grand Festival. 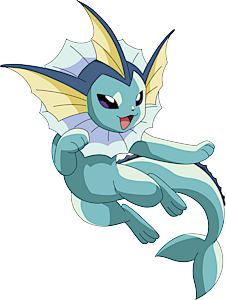 A Vaporeon appeared in Team Eevee and the Pokémon Rescue Squad!, along with an Eevee and its other evolutions, under the ownership of Virgil. A Vaporeon appeared in Eevee & Friends with an Eevee and its other evolutions, including the newly introduced Sylveon. 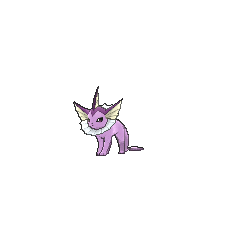 A Vaporeon appeared in Mystery on a Deserted Island!, which it evolved from one of three Eevee. A Vaporeon was among the Pokémon controlled by Cassidy and Butch in Pikachu Re-Volts. 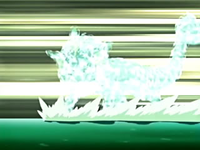 Vaporeon also appeared in The Power of One. Four Vaporeon were among the Pokémon competing in the Fire and Rescue Grand Prix in The Fire-ing Squad!. A Vaporeon was seen at a Pokémon Center in The Legend of Thunder!. A Vaporeon made a small cameo in Pokémon Heroes: Latios & Latias under the ownership of a Trainer who was giving it some water. Also, a Vaporeon was used by a competitor in the Tour de Alto Mare. A Vaporeon appeared in Gary's explanation in Johto Photo Finish. Lola owns a Vaporeon as seen in A Family That Battles Together Stays Together!. Multiple Vaporeon appeared in the opening of Destiny Deoxys. Vaporeon made a small cameo in the beginning of Giratina and the Sky Warrior together with an Eevee and the other six Eeveelutions. A Vaporeon appeared in Tag Team Battle Inspiration! when Shauna fantasized about Serena's Eevee evolving someday. Ash battled Rainer's Vaporeon in To Evolve or Not to Evolve, That is the Question!. In Blame it on Eevee, a mutated Eevee could switch between his evolved forms, one of which is a Vaporeon. Red catches him and adds him to his team and names him Vee. Later using the Fire, Water and Thunder stones of Vermilion Harbor, which were given to him by Giovanni, to evolve and devolve him freely and faster. Eventually, he lost the ability to devolve after permanently becoming an Espeon, but Red felt more content now that he'd been freed from the pain that Team Rocket's experiments had dealt. When Yellow fantasized about Pokémon that could evolve via stone a Vaporeon appeared along with an Eevee, Jolteon and Flareon in The Kindest Tentacruel. In Pokémon Yellow, Vaporeon is programmed to learn both Haze and Mist at level 42; however, a bug prevents a Pokémon from learning two moves at the same level, so Vaporeon cannot learn Mist in Yellow. 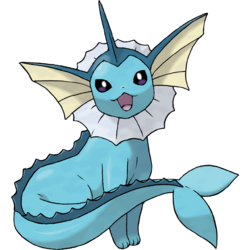 Vaporeon's origins are uncertain, though it could be based on a cross between aquatic creatures, felines, and canids. The fins and dorsal lining may be based on different types of tropical fish. Its ears resemble a mix between a fish's fin and a fennec fox's or caracal's ears. It also shares characteristics with mermaids. Vaporeon may also be inspired by the Telchines of Greek mythology, or the Merlion, a national symbol of Singapore. Its ability to become invisible and turn into water might be inspired by the Asrai. Vaporeon's resemblance to both carnivorans and cetaceans could be based on primitive whales, such as Kutchicetus. Its fringe around its neck resembles a ruff.